In Dave Abraham’s WWDC talk, Embracing Algorithms, he talks about finding common algorithms and extracting them into the generic (and testable) functions. One thing in this vein that I like to look for is a few collection operations that cluster together that can be combined into a single operation. Often times, when combining these operations, you’ll also find a beneficial optimization that can be drawn out. The predicate block stays exactly the same and the result is the same, but it’s shorter, more semantic, and more performant, since it’s not allocating a new array and finding every single object in the array that passes the test — just the first. 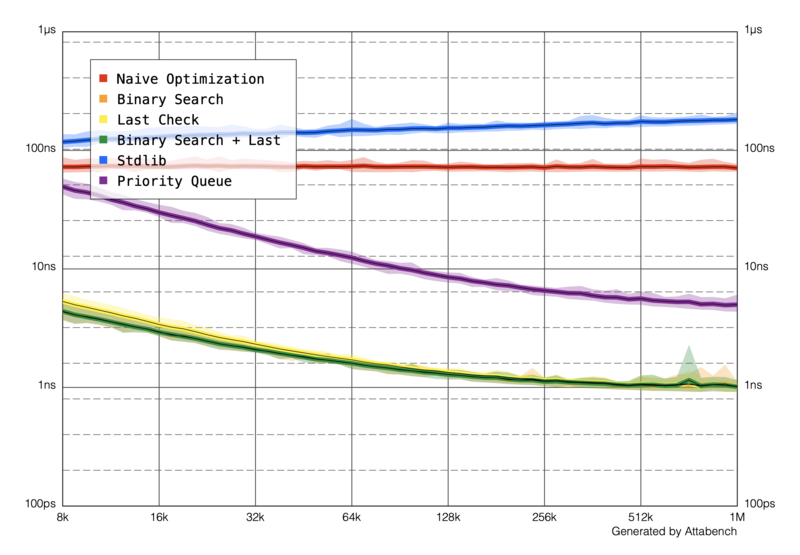 Again: shorter, more semantic, and more performant. No arrays allocated, no extra work done. In a particular project of ours, we had one common pattern where we would do a sort followed by a prefix. This code, for example, needed to find the 20 most recently created images. You could also imagine something like a leaderboard, where you want the top 5 users with the highest scores. I stared at this code until my eyes began to bleed. Something was fishy about it. I started thinking about the time complexity. If you think of the length of the original array as n, and the number of items you want to end up with as m, you can start to analyze the code. The sort is O(nlogn), and prefixing is a very cheap operation, O(1). (Prefixing can be as slow as O(m), but arrays, which are what we are dealing with here, are random access collections and can prefix in constant time. Here’s what was bugging me: Getting the single smallest element of a sequence (using min()) requires only a single pass over the all of its contents, or O(n). Getting all of the elements ordered by size is a full sort, or O(nlogn). Getting some number m of them where m is smaller than n should be somewhere in between, and if m is much, much smaller than n, it should be even closer to O(n). In our case, there are lots of images (n is about 55,000) and the amount we’re actually interested in small (m is 20). There should be something to optimize here. Can we optimize sorting such that will only sort the first m elements? For each element, we need to find the index of the first item that’s larger than it. Given our areInIncreasingOrder function, we can do this by passing the element first, and each element of result second. The time complexity of this is a bit tougher to analyze, but we can do it. The sort of the initial bit is O(mlogm). The big outer loop is O(n), and each time it loops, it calls index(where:) (O(m)) and insert(_:at:) (O(m) as well). (Insertion is O(m) because it potentially has to slide all the elements down to make space for the new element.) Therefore, the time complexity of this is O(mlogm + n * (m + m)), or O(mlogm + 2nm). Constants fall out, leaving us with O(mlogm + nm). If m is much, much smaller than n, the m terms become more or less constant, and you end up with O(n). That’s a good improvement over our original O(nlogn)! For our original numbers of 55,000 images, that’s should be a roughly five-fold improvement. This function that we’ve written is broadly an optimization over prefix + sort, but there are two smaller optimizations that I want to discuss here as well. There’s one pretty low hanging fruit optimization here. We’re looking for the smallest 20 items in an array of 55,000 elements. Most (almost all!) of the elements we check are not going to be needed for our result array. If we throw in one check to see if the element we’re looking at is larger than the last element in the result array, and if it is, just skip it entirely. There’s no sense searching through the array for its insertion index if the element is larger than the last element of result. Testing with this check enabled caused a 99.5% drop in linear searches through the result array, and the whole algorithm increased roughly 10x in speed. I want to credit to Greg Titus for pointing this optimization out to me — I would have missed it entirely. If you want to go take another step, you can do one more (slightly harder to implement) optimization. This one relies on two facts. First, we’re using index(where:) to find the insertion in the result array; second, the result is always sorted. index(where:) is a linear operation by default, but if we’re searching through an already-sorted list, it can be tempting try and replace the linear search with a binary search. I took a crack at this. To understand how these optimizations affected the performance of the algorithm, Nate Cook helped me become familiar with Karoy Lorentey’s Attabench tool, benchmarking each of these solutions. Because all of our complexity analysis until this point was theoretical, until we actually profile the code we’re concerned with (and ideally on the devices in question), any conclusions are just educated guesses. For example, sort generally is O(nlogn), but different algorithms handle different kinds of data differently. For example, already sorted data might be slower or faster to sort for a particular algorithm. Attabench showed me a few things. Second, the “last check” and the binary search optimizations have almost exactly the same performance characteristics when they are on their own (you can’t actually see the orange and yellow lines because they’re behind the green), as when they’re used together. However, because binary search is hard to write and even harder to get right, you may decide it isn’t worth it to add. The takeaway here for me is that profiling and optimizing is hard. While complexity analysis can seem a bit academic — “When am I going to use this in my real career?” one asks — understanding the time and space complexity of your algorithms can help you decide which directions to explore. In this case, understanding the time complexity of sorting led us towards a broad idea which bore fruit. Finally, benchmarking and profiling with a wide variety of data leads to the most accurate information about how your code will work in production. And also, next time you see a sort followed by a prefix, think about replacing it with smallest(_: by:). Foundation’s URL loading is robust. iOS 7 brought the new URLSession architecture, making it even more robust. However, one thing that it’s never been able to do natively is multipart file uploads. What is a multipart request? Multipart encoding is the de facto way of sending large files over the internet. When you select a file as part of a form in a browser, that file is uploaded via a multipart request. The exact content of the boundary is not important, it just needs to be a series of bytes that is not present in the rest of the body (so that it can meaningfully act as a boundary). You can use a UUID if you like. That’s pretty much it. It’s not a particularly complicated spec. In fact, when I was writing my first client-side implementation of multipart encoding, I was a bit scared to read the RFC for multipart/form-data. Once I took a look at it, however, I understood the protocol a lot better. It’s surprisingly readable, and nice to go straight to the source for stuff like this. That first implementation was in the Backchannel SDK, which is still open source. You can see the BAKUploadAttachmentRequest and the BAKMultipartRequestBuilder, which combine to perform the bulk of the multipart handling code. This particular implementation only handles a single file and no metadata, but it serves as an example of how this request can be constructed. You could modify it to support metadata or multiple files by adding extra “parts”. However, if you want to upload multiple files, whether your service expects one request with many files or many requests with one file each, you’ll soon run into a problem. If you try to upload too many files at once, your app will crash. Because this version of the code loads the data that will be uploaded into memory, a few dozen full-size images can crash even the most modern phones. The typical solution to this is to “stream” the files off the disk. The idea is that the bytes for any given file stay on the disk, until the moment they’re needed, at which point they’re read off the disk and sent straight to the network machinery. Only a small amount of the bytes for the images is in memory at any given time. I came up with two broad approaches to solving this problem. First, I could write the entire data for the multipart request body to a new file on disk, and use an API like URLSession’s uploadTask(with request: URLRequest, fromFile fileURL: URL) to stream that file to the API. This would work, but it seemed like it should be possible to accomplish this without writing a new file to the disk for each request. There would also be a bit of cleanup to handle after the request has been sent. The second approach is to build a way to mix data in memory with data on the disk, and present an interface to the network loading architecture that looks like a chunk of data from a single source, rather than many. If you’re thinking this sounds like a case for class clusters, you’re dead on. Many common Cocoa classes allow you to make a subclass that can act as the super class by implementing a few “primitive” methods. Think -count and -objectAtIndex: on NSArray. Since every other method on NSArray is implemented in terms of those two, you can write optimized NSArray subclasses very easily. You can create an NSData that doesn’t actually read any data off the disk, but rather creates a pointer directly to the data on disk, so that it never has to load the data into memory to read it. This is called memory mapping, and it’s built on a Unix function called mmap. You can use this feature of NSData by using the .mappedIfSafe or .alwaysMapped reading options. And NSData is a class cluster, so if we could make a ConcatenatedData subclass (that works like FlattenCollection in Swift) that allows you treat many NSData objects as one continuous NSData, we would have everything we need to solve this problem. However, when we look at the primitive methods of NSData, we see that they are -count and -bytes. -count isn’t a big deal, since we can easily sum up the counts of all the child datas; -bytes, however, poses a problem. -bytes should return a pointer to a single continuous buffer, which we won’t have. To handle discontinuous data, Foundation gives us NSInputStream. Fortunately, NSInputStream is also a class cluster. We can create a subclass that makes many streams look like one. And with APIs like +inputStreamWithData: and +inputStreamWithURL:, we can easily create input streams that represent the files on the disk and the data in memory (such as our boundaries). You can see my implementation of a serial InputStream here (Objective-C, but I’ll probably write a Swift version soon as well). You can compose the metadata for the upload and the dataStream for the file to upload together into one big stream. The httpBodyStream and httpBody fields are exclusive — only one can be set. Setting the input stream invalidates the Data version and vice versa. The key to streaming file uploads is being able to compose many disparate input streams into one. Something like SKSerialInputStream makes the process a lot more manageable. Even though subclassing NSInputStream can be a bit perilous, as we’ll see, once it’s solved the solution to the problem falls out more or less naturally. The actual process of subclassing NSInputStream wasn’t fun. Broadly put, subclassing NSInputStream is hard. You have to implement 9 methods, 7 of which can have trivial default implementations that the superclass should handle. The documentation only mentions 3 of the 9 methods, and you have to dig to find out that you have to implement 6 more methods from NSStream (the superclass of NSInputStream) including two run loop methods where empty implementations are valid. There also used to be 3 private methods that you had to implement, though they don’t seem to be a concern any longer. Once you’ve implemented these methods, you also have to support several readonly properties as well: streamStatus, streamError, and delegate need to be defined. Once you get all the details about subclassing right, you get to the challenge of providing an NSInputStream that behaves in a way that other consumers would expect. The state of this class is heavily coupled in non-obvious ways. There are a few pieces of state, and they all need to act in concert at all times. For example, hasBytesAvailable is defined separately from the other state, but there are still subtle interactions. I found a late-breaking bug where my serial stream would ideally return self.currentIndex != self.inputStreams.count for hasBytesAvailable, but that caused a bug where the stream stayed open forever and would cause a timeout for the request. I patched over this bug by always returning YES, but I never figured out the root of it. Another piece of state, streamStatus, has many possible values, but the only ones that seem to matter are NSStreamStatusOpen and NSStreamStatusClosed. The final interesting piece of state is the byte count, returned from the read method. In addition to returning a positive integer for the byte count, a stream can return a byte count of -1, which indicates an error, which then has to be checked by via the streamError property, which must no longer be nil. It can also return a byte count of 0, which, according to the documentation, is another way that to indicate that the end of the stream has been reached. The documentation doesn’t guide you what combinations of states are valid. If my stream has a streamError, but the status is NSStreamStatusClosed rather than NSStreamStatusError, will that cause a problem? Managing all this state is harder than it needs to be, but it can be done. I’m still not fully confident that SKSerialStream behaves perfectly in all situations, but it seems to support uploading multipart data via URLSession well. If you use this code and find any issues, please reach out and we can make the class better for everyone. Back in the days before Crusty taught us “protocol-oriented programming”, sharing of implementations happened mostly via inheritance. In an average day of UIKit programming, you might subclass UIView, add some child views, override -layoutSubviews, and repeat. Maybe you’ll override -drawRect. But on weird days, when you need to do weird things, you start to look at those other methods on UIView that you can override. One of the more eccentric corners of UIKit is the touch handling subsystem. This primarily includes the two methods -pointInside:withEvent: and -hitTest:withEvent:. -pointInside: tells the caller if a given point is inside a given view. -hitTest: uses -pointInside: to tell the caller which subview (if any) would be the receiver for a touch at a given point. It’s this latter method that I’m interested in today. Apple gives you barely enough documentation to figure out how to reimplement this method. Until you learn to reimplement it, you can’t change how it works. Let’s check out the documentation and try to write the function. This method ignores view objects that are hidden, that have disabled user interactions, or have an alpha level less than 0.01. Let’s put some quick guard statements up front to handle these preconditions. This method traverses the view hierarchy by calling the -pointInside:withEvent: method of each subview to determine which subview should receive a touch event. While a literal reading of the documentation makes it sound like -pointInside: is called on each of the subviews inside a for loop, this isn’t quite correct. -pointInside: is another override point for UIView. Its default implementation checks if the point that is passed in is contained within the bounds of the view. If a view returns true for the -pointInside: call, that means the touch event was contained within its bounds. If -pointInside:withEvent: returns YES, then the subview’s hierarchy is similarly traversed until the frontmost view containing the specified point is found. So, from this, we know we need to iterate over the view tree. This means looping over all the views, and calling -hitTest: on each of those to find the proper child. In this way, the method is recursive. The point that we are passed is defined relative to the coordinate system of this view, not the subview that we’re interested in. Fortunately UIKit gives us a handy function to convert points from our reference to the reference frame of any other view. Once we have a converted point, we can simply ask each subview what view it thinks is at that point. Remember, if the point lies outside that view (i.e., -pointInside: returns false), the -hitTest will return nil, and we’ll check the next subview in the hierarchy. Once we have our loop in place, the last thing we need to do is return self. If the view is tappable (which all of our guard statements assert), but none of our subviews want to take this touch, that means that the current view, self, is the correct target for the touch. Now that we have a reference implementation, we can begin to modify it to enable specific behaviors. put an invisible view over the scrollable area. override -hitTest: on the invisible view to pass all touches through to the scrollview. The -hitTest: method was the cornerstone of this technique. Because hit testing in UIKit is delegated to each view, each view gets to decide which view receives its touches. This enables you to override the default implementation (which does something expected and normal) and replace it with whatever you want, even returning a view that’s not a direct child of the original view. Pretty wild. Let’s take a look at a different example. If you’ve played with this year’s version of Beacon, you might have noticed that the physics for the swipe-to-delete behavior on events feel a little different from the built-in stuff that the rest of the OS uses. This is because we couldn’t quite get the appearance we wanted with the system approach, and we had to reimplement the feature. As you can imagine, rewriting the physics of swiping and bouncing is needlessly complicated, so we used a UIScrollView with pagingEnabled set to true to get as much of the mechanics of the bouncing for free. Using a technique similar to an older post on this blog, we set a custom page size by making our scroll view bounds smaller and moving the panGestureRecognizer to an overlay view on top of the event cell. -hitTest: is an override point for views that is rarely used, but when needed, can provide behaviors that are hard to build using other tools. Knowing how to implement it yourself gives you the ability to replace it at will. You can use the technique to make tap targets bigger, remove certain subviews from touch handling without removing them from the visible hierarchy, or use one view as a sink for touches that will affect a different view. All things are possible! Martin Fowler’s seminal 1999 book Refactoring includes a chapter with Kent Beck on “code smells”. Code smells, they say, are “certain structures in the code that suggest (sometimes they scream for) the possibility of refactoring”. One of the code smells they talk about is the Data Clump. Often you’ll see the same three or four data items together in lots of places: fields in a couple of classes, parameters in many method signatures. Bunches of data that hang around together really ought to be made into their own object. They give a quick test for a data clump: if you delete one of the data values, would the others make sense? This is a good test, and in today’s article, I’d like to propose another useful way to detect data clumps. To be honest, I thought I’d read this elsewhere, but I’ve done some deep googling and scouring of the original texts, and I can’t find any reference to it anywhere. If you do find a good reference to this thought technology, please be sure to reach out. Update: I found it. In Sandi Metz’s 2014 RailsConf talk, All the Little Things, she discusses this at ~22:30. If two or more instance variables (or parameters in a parameter list, etc) have a similar prefix or suffix, they’re probably a data clump. They should be associated with each other more closely than being placed next to each other. Three distinct examples of this stick out to me. In the fullness of time, it’s so obvious that this is a bad model. These four properties, filePath, isDownloaded, isFullyDownloaded, and expirationDate, should live on a new class, maybe called DownloadDetails, which would also serve as a nice home for any logic around this data, such as if the download is past its expiration date. The matching prefixes on the properties are the clue here that concepts are duplicated. Seeing them now, they’re begging for refactoring. Extracting data clumps is a great way to find hidden classes and responsibilities within your code, and a great way to locate their hiding spots is to look at the language you use to define the variables. If there is a relationship between the language of the two properties, perhaps there is a deeper relationship is waiting to be drawn out as well. Expressing those relationships explicitly can lead to cleaner, more testable, and more reusable code. A lot of what I do for my clients is code review. Code review is one of the better ways we know of to catch bugs early. I’ve been doing more code review in my day-to-day, and I’ve started to notice patterns arising out of the mire — little things that I see and can flag for deeper attention. One of these little smells is the case of the missing else branch. There’s a bug here. UIKit warriors have probably seen this particular bug many times and solved it an equal number of times. But because our programming tools are stuck in the Dark Ages, we can’t see the bug, so let’s spin up a little virtual machine in our brains. We’ll need to keep track of the text of the sender, the user’s keyboard entry, and the enabled state of the submitButton. What happens when if the user types their 8 characters and then deletes one? The button becomes enabled, but stays enabled when they delete a character. The bug is hard to spot, but, if the title of the blog post doesn’t give it away, easy to fix. Now, when the user types in their 8 characters and deletes one, the submit button is correctly disabled. Leaving out the else branch meant that a path of code wasn’t fully handled. Swift lets us elide the else branch, which it conceals its true nature: the code path was empty. At first glance, the code seems sensible. If there’s no address, hide the addressLabel. That probably causes some side effect in layout, maybe moving some neighboring views around. But similar to the last example, there’s a bug. Let’s spin up another virtual machine to model all this state. This particular code has an issue on reuse. What happens if the cell is used for a venue without an address, then used for a venue with an address? The addressLabel is hidden and never unhidden. Much simpler, with zero branching. You can approximate this behavior in Swift by returning something — you have to include an else branch. For example, this code won’t compile. How could it? If you think about the myriad ways Swift gives you to handle branching — stuff like guard, assigning a boolean, ternaries, and of course, our friendly neighborhood if statement — the if statement is the only that lets the user leave out one of the branches. Even switch requires you to either exhaustively handle all cases or include a default case. From that perspective, leaving the else out is almost syntactic sugar. In some ways, it’s comparable to using a exclamation point to force unwrap. You can do it, but you’re leaving code paths unwritten. Writing an if with no else isn’t wrong per se, it’s just a smell. When you see it, give it a second pass and really make sure that if it were there, the else branch would actually have no code in it. There’s quite a bit of conversation on Swift Evolution about the potential future of Sequence and Collection hierarchy. There’s a number of problems that the community is trying to solve and a variety of approaches that have been presented to solve them. Several of these approaches include the ability to create infinite collections, and every time anyone brings this up, someone invariably asks how they would work. Nothing in the type system prevents us from making an infinite collection — it’s purely a semantic constraint — meaning that while we can write infinite collections in Swift today, we’re not supposed to. It violates the assumptions that other people’s code will make about our object. In this post, I’ll take an infinite sequence and demonstrate how we could turn it into an infinite collection. The Fibonacci numbers are a great example of an infinite sequence. For a quick refresher, each element in that sequence is the sum of the previous two numbers. Calling fib.prefix(10) will give you the first 10 Fibonacci numbers. Note that this is an infinite sequence! If you try to map over this sequence (which the type system fully allows! ), your program will just spin infinitely until it runs out of integers or the heat death of the universe, whichever comes first. To convert this into an infinite collection, we need to think about a few things. First, how will we represent an index to a value? For an array, this is a number that probably represents a memory offset. For a string, this might represents a byte offset that that character starts at. It needs to be some value that lets us retrieve the value at that index at constant time, or O(1). We can use (Int, Int) (our state from the fibonacci numbers when they were a sequence) as the index, and use (0, 1) as our starting value (just like our sequence). (This isn’t how we’d use our collection, since we know it’s infinite, but this is how normal collections work.) Two things stand out. First, we need the Index type to be Comparable — so we can’t use a tuple — and we need endIndex to be defined so that we can check against it — so we can’t fatalError (ding!). This is pretty good! We get all of the methods from the Sequence and Collection protocols for free. Unfortunately, this is still an infinite collection, and just like the infinite sequence, we can’t map over it, or we’ll risk looping forever. There are new things on the Collection protocol that we also can’t do — like get the count of this collection. That will also spin forever. There is one more tweak I’d like to show here, which is extracting the Fibonacci-specific parts of this and making a generic InfiniteCollectionIndex. To do this, we’d keep our basic enum’s structure, but instead of the .reachable case having type (Int, Int), we’d need to put a generic placeholder there. How would that look? This function takes a block that assumes that the value is .reachable, and returns whatever that block returns. If the value is .unreachable, it crashes. It’s not clear which way the tides will ultimately shift with Swift’s Collection model, but if and when infinite collections become legal in Swift, this technique will help you define them easily. Last year I wrote a post about how adding simple optional properties to your classes is the easy thing to do when you want to extend functionality, but can actually subtly harm your codebase in the long run. This post is the spiritual successor to that one. This should be very easy to test. So far, so good. func stepAfter(_ currentStep: AuthFlowStep, context: UserState) -> AuthFlowStep? When we get nextState, it’s optional, so the default move here is to guard it to a non-optional value. That little question mark lets me match an optional case of an enum. It makes for better code, but something still isn’t sitting right. If I’m doing one big switch, why am I trying to unwrap a nested thing? What does nil mean in this context again? When you slot an enum into the Optional type, you’re essentially just adding one more case to the Wrapped enum. But we have total control over our AuthFlowStep enum! We can change it and add our new case directly to it. And our switch statement now switches directly over all the cases, with no special handling for the nil cases. First, what was once nil is now named. Before, users of this function might not know exactly what it means when the function returns nil. They either have to resort to reading documentation, or worse, reading the code of the function, to understand when nil might be returned. Second, simplicity is king. No need to have a guard then a switch, or a switch that digs through two layers of enums. One layer of thing, always easy to handle. Lastly, precision. Having return nil available as a bail-out at any point in a function can be a crutch. The next developer might find themselves in an exceptional situation where they’d like to jump out of the function, and so they drop a return nil Except now, nil has two meanings, and you’re not handling one of them correctly. I’m using flow states as a general example here, but I think the pattern can be expanded to fit other situations as well — anytime you have an enum and want to wrap it in an optional, it’s worth thinking if there’s another enum case hiding there, begging to be drawn out. Thanks to Bryan Irace for feedback and the example for this post. In Apple’s documentation, they suggest you use a pattern called MVC to structure your apps. However, the pattern they describe isn’t true MVC in the original sense of the term. I’ve touched on this point here before, but MVC was a design pattern created for Smalltalk. In Smalltalk’s formulation, each of the 3 components, model, view, and controller, each talked directly to each other. This means that either the view knows how to apply a model to itself, or the model knows how to apply itself to a view. When we write iOS apps, we consider models and views that talk directly to each other as an anti-pattern. What we call MVC is more accurately described as model-view-adapter. Our “view controllers” (the “adapters”) sit in between the model and view and mediate their interactions. In general, I think this is a good modification to MVC — the model and view not being directly coupled together and instead connected via an intermediary seems like a positive step. However, I will caveat this by saying that I haven’t worked with many systems that don’t maintain this separation. So, that’s why we have view controllers in iOS. They serve to glue the model and view together. Now, there are downstream problems with this style of coding: code that doesn’t obviously belong in models or views ends up in the view controller, and you end up with gigantic view controllers. I’ve discussed that particular problem on this blog many times, but it’s not exactly what I want to talk about today. I’ve heard whispers through the grapevine of what’s going on under the hood with UIViewController. I think the longer you’ve been working with UIKit, the more obvious this is, but the UIViewController base class is not pretty. I’ve heard that, in terms of lines of code, it’s on the higher end of 10,000 to 20,000 lines (and this was a few years ago, so they’ve maybe broken past the 20 kloc mark at this point). When you want the benefits of an object to glue a UIView and a model object (or collection thereof) together, typically, we use view controller containment to break the view controller up into smaller pieces, and compose them back together. However, containment can be finicky. It subtly breaks things if you don’t do it right, with no indication of how to fix any issues. Then, when you finally do see your bug, which was probably a misordering of calls to didMove or willMove or whatever, everything magically starts working. In fact, the very presence of willMove and didMove suggest that containment has some invisible internal state that needs to be cleaned up. I’ve seen this firsthand in two particular situations. First, I’ve seen this issue pop up with putting view controllers in cells. When I first did this, I had a bug in the app where some content in the table view would randomly disappear. This bug went on for months, until I realized I misunderstood the lifecycle of table view cells, and I wasn’t correctly respecting containment. Once I added the correct -addChildViewController calls, everything started working great. To me, this showed a big thing: a view controller’s view isn’t just a dumb view. It knows that it’s not just a regular view, but that it’s a view controller’s view, and its qualities change in order to accommodate that. In retrospect, it should have been obvious. How does UIViewController know when to call -viewDidLayoutSubviews? The view must be telling it, which means the view has some knowledge of the view controller. The second case where I’ve more recently run into this is trying to use a view controller’s view as a text field’s inputAccessoryView. Getting this behavior to play nicely with the behavior from messaging apps (like iMessage) of having the textField stick to the bottom was very frustrating. I spent over a day trying to get this to work, with minimal success to show for it. I ended up reverting to a plain view. I think at a point like that, when you’ve spent over a day wrestling with UIKit, it’s time to ask: is it really worth it to subclass from UIViewController here? Do you really need 20,000 lines of dead weight to to make an object that binds a view and a model? Do you really need viewWillAppear and rotation callbacks that badly? So, what does UIViewController do that we always want? Bind a model to a view. What does it do that we usually don’t care about? Provide storage for child view controllers. Forward appearance (-viewWillAppear:, etc) and transition coordination to children. Can be presented in container view controllers like UINavigationController. So, with this knowledge, we now know what to build in order to replace view controllers for the strange edge cases where we don’t necessarily want all their baggage. I like this pattern because it tickles my “just build it yourself” bone and solves real problems quickly, at the exact same time. There is one open question, which is what to name it. I don’t think it should be named a view controller, because it might be easy to confuse for a UIViewController subclass. We could just call it a regular Controller? I don’t hate this solution (despite any writings in the past) because it serves this same purpose a controller in iOS’s MVC (bind a view and model together), but there are other options as well: Binder, Binding, Pair, Mediator, Concierge. The other nice thing about this pattern is how easy it is to build. It almost seems like heresy to create an object like this and not subclass UIViewController, but when UIViewController isn’t pulling its weight, it’s gotta go. You already know how to add functionality to your new object. In this case, the controller ends up being the delegate of the textField, emitting events (and domain metadata) when the text changes, and providing hooks into updating its view (the textField in this case). Even if you use this pattern, most of your view controllers will still be view controllers and subclass from UIViewController. However, in those special cases where integrating a view controller causes you hours and hours of pain, this can be a perfect way to simply opt out of the torment that UIKit brings to your life daily.